Dr Sahashi specializes in international politics and is currently focusing on East Asian security as well as Japanese security policy. His recent book is In a Search for Coexistence: the United States and Two Chinas during the Cold War (Tokyo: Keiso, 2015). He published numerous articles in Chinese, English and Japanese and is writing his next book on East Asia security order and architecture. He received his B.A. from International Christian University and his Ph.D. from the Graduate Schools for Law and Politics at the University of Tokyo. He also studied at Department of Political Science, University of Illinois at Urbana-Champaign. Before joining the University of Tokyo in 2019, he taught at Australian National University and Kanagawa University. 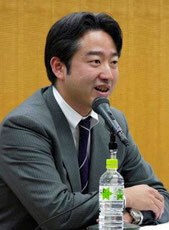 He serves as Research Fellow, Japan Center for International Exchange. Dr Sahashi has been Visiting Associate Professor, Walter H. Shorenstein Asia Pacific Research Center, Stanford University and Shigeru Yoshida Chair, Instituto Tecnológico Autónomo de México (ITAM). He also served adjunct Senior Research Fellow at Sasakawa Peace Foundation, Tokyo Foundation-German Marshall Fund of the United States Partnership Fellow, and Guest Researcher for First Special Committee Research Office, House of Councilors.